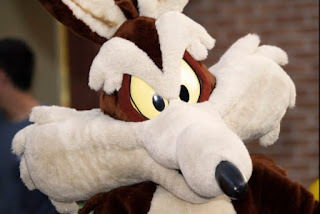 -- Wile E. Coyote's main goal is to finally catch Road Runner. He is one clever predator. He thinks he is a scientific genius. He has invented hundreds of ways to catch Road Runner. But his inventions have a way of failing in unexpected ways. Watch as he builds wild vehicles and traps to help him catch that bird. Will his experiments with forces and motion be successful? Or will his inventions blow up in his face? With light-hearted text and fun illustrations, readers learn basic science while enjoying Wile E.'s wacky misadventures! • Wile E. Coyote and Road Runner Bendable Pair -- Wile E. Coyote and The Road Runner Bendable Pair Warner Bros. Looney Tunes The Road Runner measures 4.5 inches tall. Fun bendable figures. 3 years and up. • Wile E. Coyote Cartoon Bumper Sticker -- Adhesive backing - can be applied to all types of flat surfaces. Weather-resistant - can be used indoor and outdoor. Can be removed easily without leaving any residue behind . • Road Runner and Wyle E Coyote Tin Sign -- Nostalgic, vintage, retro signs. Perfect for decorating your home, garage, office, shop, hunting lodge, cabin, rec room, bar or man cave. Makes great gift.